There are 9 key moments in the hiring process where employers can either keep great candidates moving forward, or lose them completely. Leading HR and talent acquisition teams are recognizing the role that communication plays during these key moments. By using automation technology as a candidate experience assistant, recruiters are able to communicate better and faster with talent, while actually humanizing the process. In this Rally How To Guide, you’ll see the communication between candidates and recruiters during these 9 key moments, and learn how savvy employers are embracing text, chat and email automation to transform the candidate experience. Featuring: CDW, TTEC, Fast Pace Urgent Care, Aurora Health Care, and more. Automation is the sidekick that handles busywork, operating outside of business hours and making one practitioner perform like 3. If implemented well, automation can turn a candidate experience that disappoints into one that delights, while also making your hiring process more scalable and your role more strategic. In many ways, the candidate experience is a communications experience. As practitioners, we’ve made great strides in what content we share with candidates to increase the authenticity and transparency about working at our companies. But to truly transform the candidate experience, we also need to improve how and when we communicate. Whether buying a product or searching for a job, people have an expectation that companies will be accessible across every social, mobile and digital channel, respond instantly 24/7 and deliver a personalized experience. These expectations can feel daunting for talent acquisition teams. There are more and more recruiting channels to manage: careers sites, social media, referral programs, recruitment events, etc. We are learning that the speed at which we can communicate with talent is becoming a key difference between meeting hiring goals or slowing our company’s growth, between creating a positive employer brand perception or fueling negative word of mouth. This is why leading HR and TA teams are turning to automation technology. For them, it’s not about replacing recruiters. It’s about using automation as a candidate experience assistant to communicate better and faster with candidates, while actually humanizing the process. 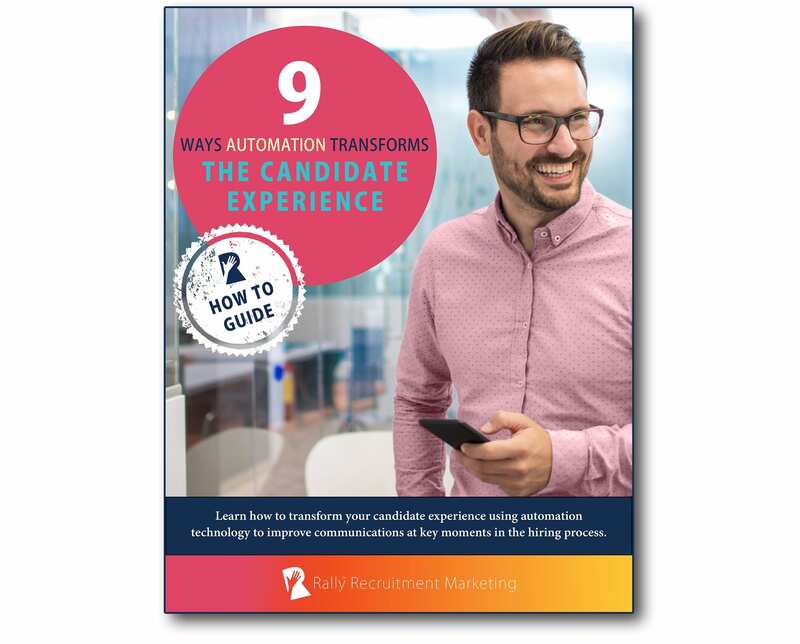 In this Rally™ How To Guide, you’ll see 9 key moments during the candidate experience where automation technology can help you transform candidate communications. We show you examples from 7 savvy employers, including CDW, TTEC, Fast Pace Urgent Care, Aurora Health Care and more.